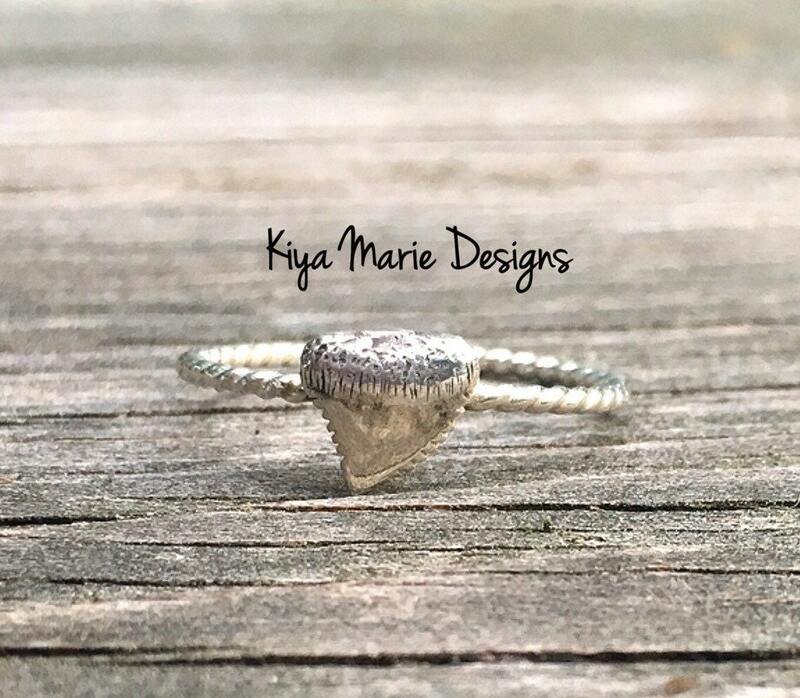 Part of my new line of stack rings, this adorable sterling silver shark tooth charm is soldered to a handcrafted Argentium Silver band. Argentium Silver is a tarnish resistant silver that is made to last and shine! It is made from 100% recycled silver, so it is 100% Eco-friendly! These are made to order. These rings are hand soldered from 16 gauge wire. The more rings you buy, the bigger the discount! These look great alone, stacked together, or stacked with my Argentium twist bands and Sterling beaded bands (available here)- https://www.etsy.com/listing/185319330/argentium-silver-stack-rings-stackable?ref=shop_home_active_3). The band can be left plain or hammered for texture. Hammered band is shown in the photos, plain is a round silver band. Please choose your desired amount of rings and size from the drop down menus. Please specify if you'd like a plain band or a hammered band in a note when checking out. If you would like more than one stack ring, please select the desired amount of rings, and include your choice in the note.